Shetland Round Britain and Ireland- and the winner is? In what can only be described as probably the most frustrating yet challenging fight to the finish for the leading Class 40’s in this hard fought battle the final positions have only been decided in the last miles off the South Devon Coast. The lead has changed so often in the final hours of this race we have lost count and could no longer see a strong contender for that coveted top of the podium or indeed any other finish positions. A thrilling end to a challenging event and one we are sure will be remembered by these front running competitors for a long time to come. We can only congratulate all the competitors of this event for providing such a wonderful action packed race, but especially we thank the crews of the Owen Clarke Design Class 40’s: Rune Aasberg & Arild Schei, Solo. Stuart Dodd & Ian Marshall, Livewire. 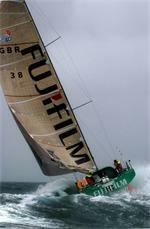 Alex Bennett & Malcolm Dickinson, Fujifilm. Andrew Dawson & Jon McColl, Spliff. Andrew Magrath & David Pugh, Roaring Forty.